The fundamental application of the receiver multicoupler is to enable multiple radio receivers, spectrum analyzers or scanners, to share a common antenna system. The advantage of using a multicoupler in signal monitoring applications were several receivers are used (such as in SIGINT/COMINT), is in the port-to-port isolation of the coupler. Isolation will reduce the possibility of RF interaction between receivers caused by local oscillators, synthesizers, etc. If an external pre-amplifier, receive filter or lightning protection device is used, only one is needed to service several receivers. Both Passive and Active broad-band models as well as narrow-band specialty couplers are manufactured with premier components to meet a multitude of VLF to UHF monitoring applications. Standard port configurations from 2 up to 8 are available. These units are designed to meet most government, military and commercial radio monitoring demands. Active models include broad-band low-noise amplifiers, front-end protection, and, depending on model, input High-Pass or Low-Pass Filters. 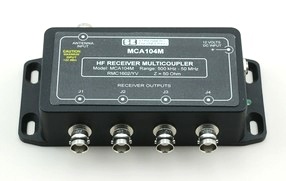 MCA104M is an active multicoupler designed to distribute HF antenna signals to four receivers without loss and with high isolation between ports. It is specifically suited for signal intercept and HF monitoring stations, both fixed or mobile platforms. It can be used in any HF monitoring post using receivers, scanners or spectrum analyzers. MCA104M has a mechanical and electrical design construction that will meet any government, military or commercial specification. This unit is designed to give high performance results in any radio monitoring post using multiple intercept receivers. Rugged die-cast aluminum enclosure with a black powder coat finish is standard, olive drab green (MIl-841OD) is also available on request. (1): EMI/RFI Ceramic feed-thru for DC power hardwired connections. (2): PCB Conformal coating for high humidity installations. 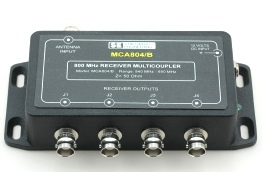 MCA108M is an active multicoupler designed to distribute HF antenna signals to eight (8) receivers without loss and with high isolation between ports. It is specifically suited for signal intercept and HF monitoring stations, both fixed or mobile platforms. It can be used in any HF monitoring post using receivers, scanners or spectrum analyzers. MCA108M has a mechanical and electrical design construction that will meet any government, military or commercial specification. This unit is designed to give high performance results in any radio monitoring post using multiple intercept receivers. Rugged die-cast aluminum enclosure with a black powder coat finish is standard, olive drab green (MIl-841OD) is also available on request. 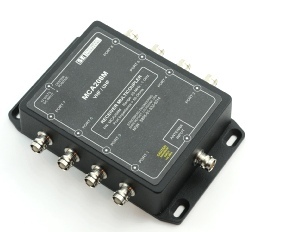 MCA204M is an active multicoupler designed to distribute VHF/UHF antenna signals to four (4) receivers without loss and with high isolation between ports. It is specifically suited for signal intercept and VHF/UHF monitoring stations, both fixed or mobile platforms. It can be used in any monitoring post using receivers, scanners or spectrum analyzers. MCA204M has a mechanical and electrical design construction that will meet any government, military or commercial specification. This unit is designed to give high performance results in any radio monitoring post using multiple intercept receivers. Rugged die-cast aluminum enclosure with a black powder coat finish is standard, olive drab green (MIl-841OD) is also available on request. MCA208M is an active multicoupler designed to distribute VHF/UHF antenna signals to eight (8) receivers without loss and with high isolation between ports. It is specifically suited for signal intercept and VHF/UHF monitoring stations, both fixed or mobile platforms. It can be used in any monitoring post using receivers, scanners or spectrum analyzers. MCA208M has a mechanical and electrical design construction that will meet any government, military or commercial specification. This unit is designed to give high performance results in any radio monitoring post using multiple intercept receivers. Rugged die-cast aluminum enclosure with a black powder coat finish is standard, olive drab green (MIl-841OD) is also available on request. 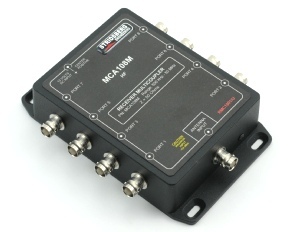 MCA804/B is an active multicoupler designed to distribute UHF antenna signals in the 800 MHz service band to four (4) receivers without loss and with high isolation between ports. It is specifically suited for signal intercept and 800 MHz monitoring stations, both fixed or mobile platforms. It can be used in any monitoring post using receivers, scanners or spectrum analyzers. MCA804/B has a mechanical and electrical design construction that will meet any government, military or commercial specification. This unit is designed to give high performance results in any radio monitoring post using multiple intercept receivers. Rugged die-cast aluminum enclosure with a black powder coat finish is standard, olive drab green (MIl-841OD) is also available on request. The basic application of the passive multicoupler is to split a signal, in-phase, to the outputs. It can also act as a signal combiner with the ability to combine two or more signals, in-phase, to a common output generally called the “Sum” port. This feature is very useful in combining antenna signals for a receiving system, or, for laboratory use in combining RF signals for measurement and study. Because of the “passive” design they do not need power to operate. Our passive multicouplers are designed to operate to specifications in a 50 ohm system and all are compatible with any of the “active” multicouplers on this page. 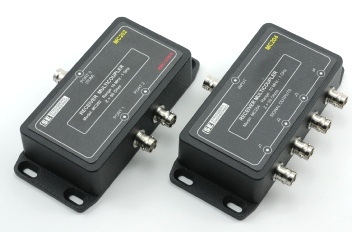 For example, a two port splitter such as the MC202 may be connected to two (2) MCA208M VHF/UHF couplers for a total of 16 ports, etc. Please consult the table below for the model that best covers your intended frequency use range. Although they have substantial frequency overlap, the upper and lower frequency limits may be of importance. (1): PCB Conformal coating for high humidity installations. 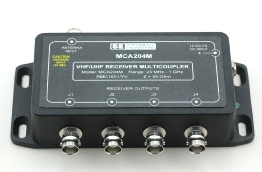 MCA04VLF is a 4-port active VLF/LF multicoupler designed to distribute an input signal (antenna, transducer or other signal source) to four output ports for connection to receivers, spectrum analyzer or other test equipment. Premium low frequency components have been used in the design of this device resulting in superior frequency response with full electrical specifications down to 10 kHz. Mechanically the MCA04VLF it is very rugged and meet MIL STD-810 environmental operations. 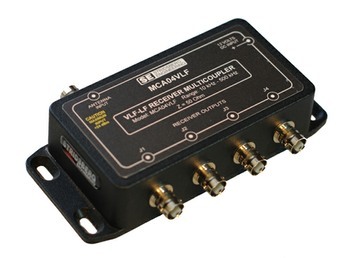 MCA04VLF ships complete with a regulated power supply for the North American market. Outside United States and Canada, a 6 foot DC cord is supplied for connection to customers power source. A well regulated +12 volt power supply is required, current drain is approximately 85 mA. (5): Olive Drab (Green MIL-1822) baked enamel coating. Please contact factory for data sheet or additional technical information. RG-58A/U with BNC male connectors, sweep tested to 1.5 GHz.